Every business needs a proper fire alarm system! For all building owners and facilities management professionals, fire alarm systems can be both a massive burden and an essential safety component to protect all occupants of the building. 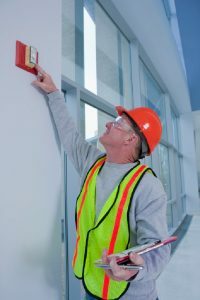 While fire alarm systems are typically thought of by building owners as a system that is mandatory to gain occupancy, a poorly designed fire alarm system can become quite a burden to the proprietor that the primary intent to protect others and property can become overlooked or only lost entirely. In fact, choosing and properly designing a fire alarm system is critical for both the safety of all occupants and your business’s bottom line. As a result, we’ve created this handy guide detailing the factors you should consider for your next new construction or facilities upgrade project. Even if the fire prevention codes do not mandate a detection system, it may behoove you to invest and install one of the many technologies available that can detect a fire early and enable a swift response. These days, modern fire alarm systems are considered “intelligent” systems. These are properly designed fire alarm systems that tend to reduce the number of false fire alarms to huge buildings. Also, the maintenance for intelligent fire alarm systems is significantly small which can save your company a lot of money in the end. In fact, these early detection technologies can provide incredible detection of a fire and the source a lot sooner than older technologies. As a result, investing in newer fire alarm systems can really do wonders for the safety of your employees and business alike. As soon as an actual event triggers an alarm on the fire alarm control panel, it will send a notification to the fire department and the occupants in the building as well. In fact, the loud and audible notification of a fire alarm system needs to be designed so that all individuals in every area of the building can hear the warning. This entry was posted on Friday, September 22nd, 2017 at 9:46 am. Both comments and pings are currently closed.